If you can't visit us in Kittery, we invite you to shop us online at www.ktp.com where you'll find quality brand name casual and sport-specific apparel and footwear, including a fantastic selection of outdoor recreation gear, accessories and gifts for the home & hearth! 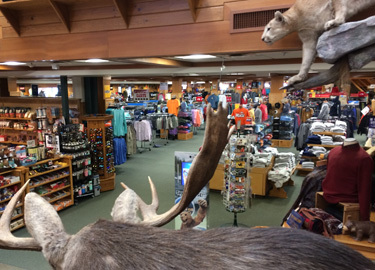 A Maine destination featuring three levels of the most extensive selection of outdoor recreational equipment, apparel and footwear available in New England. Approximately 45 minutes from Portland, take Interstate 95 South. Immediately after the Maine Turnpike toll booth, take Exit 7 - York/Berwicks to Coastal Route One South. Kittery Trading Post is just 5 miles down the road on the right. Kittery Trading Post is located in Southern Maine, only a one hour drive from Boston. Take Interstate 95 North to Exit 3 - Coastal Route One. We're just a half mile up the road on the left.